During sleep is manifested by reduced reactivity to external stimuli with alternating phases of sleep. The majority of the adult population is sleeping 7-8 hours a day, dependent on the age or health of the person. For normal range is considered to be about sleep 4 to 11 hours. Wake is a preparatory phase, phase of sleep. The organism is released and with closed eyelids expected to sleep. This is an important phase, which may affect the quality of sleep. Usually it occurs during sleep, waking several phases, when for a moment he wakes up and falls asleep again. At this stage the present consciousness. NREM 1 - the beginning of sleep, slow eye movements, partial consciousness (sometimes hallucinations), twitching limbs (sometimes restless leg syndrome). It's subphase light sleep. NREM 2 - reduce muscle tension, loss of consciousness. This phase is taken also as a light sleep and represents 40-45% of the total length of sleep. NREM 3 - introduction into a deep sleep (ie. SWS), it's actually anteroom next subphase. Sometimes it occurs with sweating, somnambulism, nightmare, speaking of sleep. NREM 4 - deep sleep, difficulty waking up. There is a consolidation of memory for data and events (ie. Declarative memory). The brain of a sleeping man is able to distinguish the importance of auditory stimuli such as addressing its own name on a neutral expression does not respond. In general, the sleep is true that during it decreases blood pressure, respiratory rate and heart rate. Alpha waves on the frequency of 8 - 12 Hz, accompanied by relaxing state of alertness, drowsiness with increasing the frequency slows down and leads to sleep. Just levels of alpha is often used in teaching for example foreign languages - it is the time between wakefulness and sleep, when the brain is ready to "suction" knowledge. The beginning of the sleep takes place in the alpha level (i.e., about 5% of sleep time). Slow eye movement sleep to deep non-REM is the stage in the levels of Theta and Delta. REM - irregular, rapid eye movement activated through thought processes, the brain functions similarly to the day, with the difference that it is not affected by external stimuli, will and decision making. At this stage it is most concentrated dreams. In 2000, Israeli doctors found that during REM phase in the early hours, there is a majority of cardiac collapse. 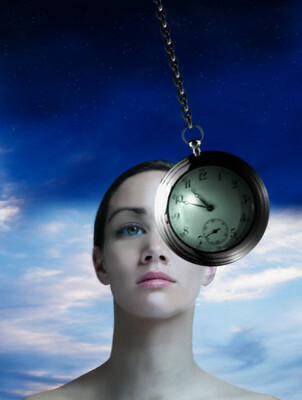 In a healthy person by loss-REM sleep there is a rebound, i.e., in the next day there is more REM-sleep as usual. In patients with primary depression suppress REM sleep leads to a better mood. Sleep disturbance reduces quality of life and health for several reasons. 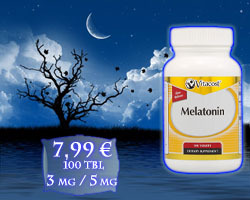 In the dark and the sleep hormone is produced melatonin called the hormone of youth. Its lack causes some cancers. His creation we need darkness, such as when near the sleeping man shine, his work will stop up to two hours.